"Over 70% of All Website Visitors To Your Page Leave In Seconds!" If you want to be more than successful online, you need to change the way you do every-day business! When the Public Change, Your Marketing Must Change! Movement Is IMPOSSIBLE to Ignore! This is the principal of the secrets to the power of Instant PopOver. Get your visitors undivided attention for a few seconds! That's all it takes for you to deliver a message to them. Version 3.0 of this incredible software is better than ever! We listened to our users and packed in virtually every feature we possibly could. The results are a MASSIVE upgrade! And the software was rebuilt from the ground up with the latest programming technology that gives you a robust software application in an easy to use package. Peeling Corner Ads — Believe it! 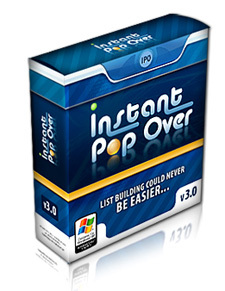 There is no need to buy a separate application just to create irresistible "Peeling Ads" because they are just 1 of the 6 types of Instant PopOver ads you can create in minutes! Turn On The Dimming Switch (Background Shading) — With this feature alone, you can grab the immediate attention of your visitors by dimming the background of your page, and placing your popover in the eyes of your visitor. I designed this software to handle every pop-up advertising need I could think of. And it uses the latest web technology to ensure that it will never be blocked by any popup blocker. The PopOvers cannot be blocked because they are actually part of the webpage! Google Toolbar, Yahoo Toolbar, whatever you have is not enough to stop it from delivering its message. Your "attention-grabbing" message gets delivered to 100% of your visitors... 100% of the time. Plus... FREE UPDATES FOR LIFE!! !